If, until relatively recently, the problem of wastewater treatment for country houses was rather difficult to solve, then today it is not even considered a problem. Previously, we had to make cesspools, improvised sewage treatment systems and constantly use the services of an ashenizator machine. 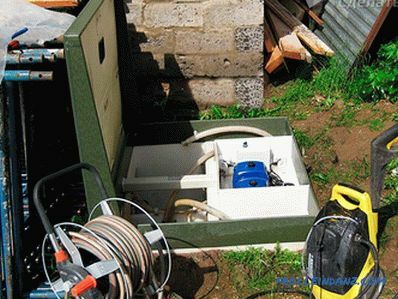 Today you can install a septic tank and no longer suffer from the treatment of wastewater. Many varieties of such treatment systems are on sale. One of them is Topas. It is about them, or rather, how to perform the installation, and will be discussed in the article. The septic tank of the Series has four compartments assembled in a single case. This design makes installation easier. 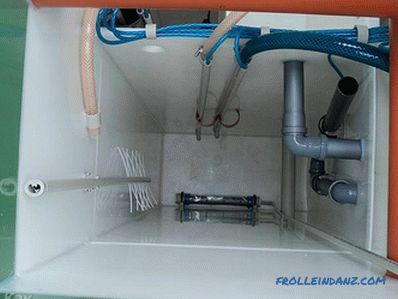 Each compartment performs its specific wastewater treatment function. The internal structure can be seen by opening the lid. If it interests you, you can watch a detailed video. All drains from sewer pipes get into the first chamber. In it there is a clearing of large fractions, they simply settle to the bottom. When the chamber is filled to a certain level, the installed float switches on the automation. After that, the pump begins to pump fluid into the second chamber. The second compartment plays the role of an aerotank. Here live, multiply and feed on bacteria. They break up large fractions of pollutants (which passed through the first chamber) and destroy organic matter. In this compartment, the silt which forms at the bottom plays a big role. It retains water and allows bacteria to better cope with their tasks. In order to make the cleaning process more active, the compressor constantly supplies fresh air, simultaneously mixing the drains and sludge. Then the liquid enters the third section. 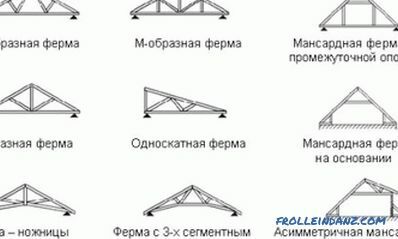 Its principle of operation is very simple, already cleaned drains pass a kind of pyramid. Here the separation of the purified liquid from sludge residues takes place. As a result, the output is almost pure water. Coarse silt settles at the bottom, and smaller and fresher returns to the second chamber for further work. In the last, fourth, chamber is the final purification of water. 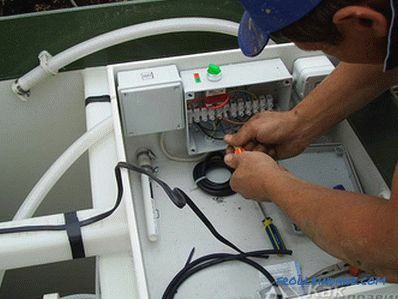 The Topas series septic tanks should work continuously. If there is a big break in the flow of sewage, the efficiency of work will dramatically decrease. The fact is that bacteria need to constantly eat. If there is no impurities, microorganisms will have nothing to eat, and they will simply die. 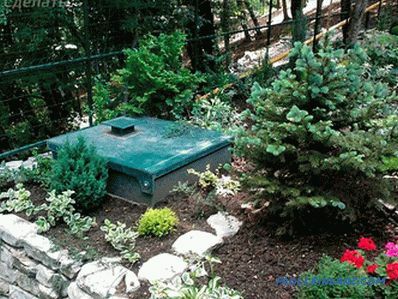 Therefore, Topas septic tanks are best placed in homes with permanent residents. Everything else, including powder, soap, and detergents can be drained without fear into the sewer. The topas may serve up to fifty years, but with proper installation and operation. The most important thing is to follow the recommendations on the substances allowed to be discharged into the sewage system. If this is not done, the colony of microorganisms will die. And this means that the treatment of wastewater will not occur. Monthly clean the deep cleaning filter. 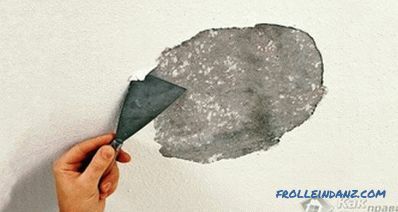 It is necessary to replace the membrane every two years. Once every four years, carry out pumping of accumulated sludge. This can be done with a deep well pump. Silt is an excellent fertilizer, so you can pump it directly to the garden bed. 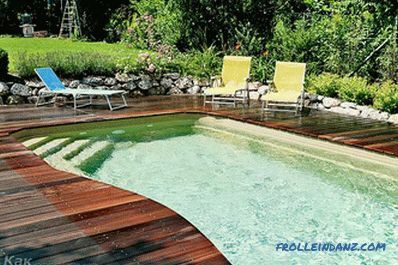 Once every ten years carry out a full cleaning with replacement of the aerator. If you follow all the manufacturer's recommendations exactly, then the septic tank will serve for many decades. Now let's talk about How to install a septic tank. There is nothing difficult in this and everything can be done independently. The only thing that will have to invite assistants when lowering the device in the pit. The place should be located near the house. According to the attached instructions, the minimum distance from the installation site to the main building is five meters. When choosing a place, try to keep the sewer pipes from the house straight into the septic tank.Unnecessary twists and turns can contribute to the formation of blockages, and therefore additional cleaning work. There should be no thick vegetation around the installation site. Tree roots and large bushes can damage the hull. It is also worth knowing the depth of soil freezing in your area. It will depend on this at what distance from the surface it is possible to lay the sewage pipes and the cleaning device itself. If the groundwater is close to the surface, the bottom of the excavation should be reinforced with a concrete slab or sand-cement screed. If we have decided on the place, then proceed to digging the pit. Its size will depend on the selected model. As a rule, such devices are relatively compact, so the digging of the pit can be done manually. When carrying out excavation work, one should not forget about the necessary gaps between the walls of the pit and the septic tank. They are needed for further filling the device with soil. Such clearances should be at least 20 cm. Also, the depth of the pit should be made larger for the device of the sand pillow. If groundwater comes close to the surface, the depth is made with regard to the installation of a concrete slab or sand-cement screed. After the foundation pit is ready, its foundation is made. The sand cushion should be at least 15 cm. Also try to make the upper part of the body protruding above the ground. 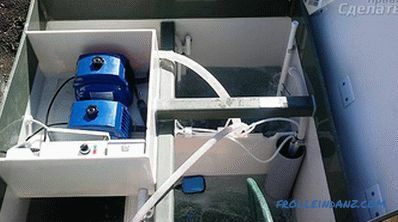 This is necessary so that spring thawed water does not flood the device's equipment. After equipping the base, lower the septic tank into the pit. This can be done manually with the assistance of an assistant. To do this, use cables through special holes in the ribs of the structure. 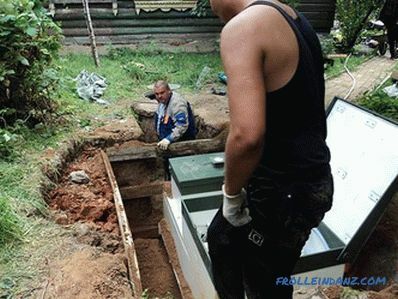 The next step is to connect the septic tank to the communications. First of all the sewer pipe is connected. It is first necessary to dig trenches for pipes and lay the pipeline itself. When laying the sewage pipes do not forget about the slope. 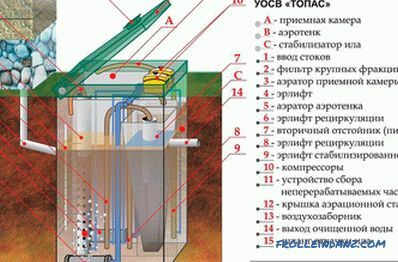 It should go from the house to the septic tank and be 1‒2 cm per each running meter. The depth of pipe laying will depend on the depth of soil freezing. As a rule, it ranges from 70 to 80 cm. 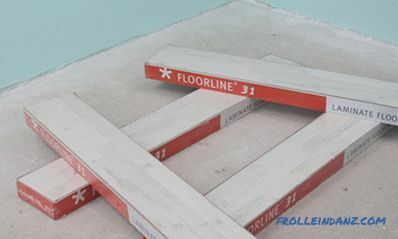 Before starting work on the connection, the Topas case must be leveled using a building level. Only in a strictly horizontal position the device will work more efficiently. A hole of the required diameter is made to connect the sewer pipe in the housing. Everything needs to be done according to the attached instructions. Then the pipe is welded to the hole, it is desirable to do this using a polypropylene cord and a building hair dryer. After the compound cools down, a sewer pipe is inserted into the nozzle. Now it’s time to connect the electrical cable. It must be held from the shield in the house with a connection to a separate machine. The cable itself is laid in a corrugated pipe and can be placed in the same trench as the sewer pipe. Electricity is connected to a special hole with cleats on the septic tank. After connecting the power supply and sewage pipes, the hull is covered with soil. This should be done gradually, in layers of 15‒20 cm. At the same time, water is poured into the tank to equalize the pressure. The water level should be slightly higher than the backfill level. 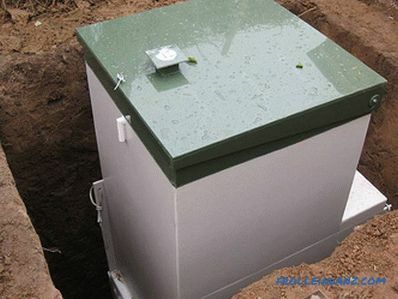 If the level of soil freezing is quite high, you can carry out the insulation of the septic tank. This is done before filling with primer. 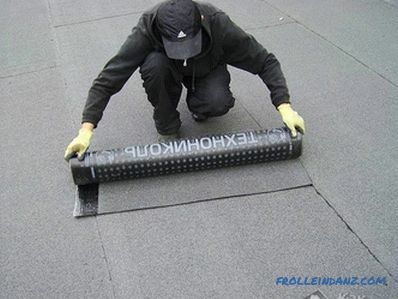 As a heater, you can use any insulating material designed for laying in the ground. This completes the installation of the Tapas septic tank. If everything is done correctly and taking into account the recommendations set forth in the instructions for the product, the device will last for decades.